New York is the most populous city in the United States and a leading centre for food, fashion and the arts. There are many words to describe the Big Apple - cool, cosmopolitan, crowded and constantly evolving, combining big-city splendour with a unique historic charm all of its own. Packed with iconic landmarks and towering skyscrapers, visitors to New York may need a bit of stamina but it’s well worth the effort. With so much to see and do to keep visitors busy. Here are some of New York’s top picks. The Met features permanent collections of over 2 million works of art. Highlights include American decorative arts, arms and armour, costumes, notable collections from antiquity and Ancient Egypt, musical instruments and photographs. There is also Cloisters, an offshoot museum of the Met that's dedicated to medieval Europe's art and architecture located in Fort Tyron Park. Located on Manhattan's Upper East Side, The Guggenheim is one of the most well-known art museums in the country, and is as famous for the cutting-edge design of its coiled building as it is for its artworks, which include some of Norman Rockwell's, Pablo Picasso's and Wassily Kandinsky's best works. The sombre but moving National September 11 Memorial & Museum serves as the primary tribute to the nearly 3,000 victims of the 2001 terrorist attacks. The museum spans across 110,000 square feet and relays the narrative of the attacks through a series of multimedia displays, real-time recordings, authentic artefacts and an interactive table. 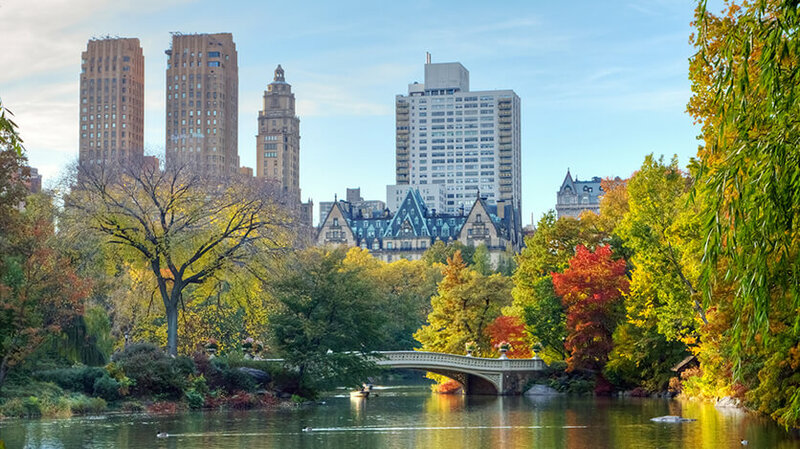 The vast green space of Central Park is a pleasure for New Yorkers and tourists alike offering a refreshing break from the intensity of the concrete jungle and is a truly beautiful area to explore and relax in. The park has many attractions within its boundaries such as Strawberry Fields, the Central Park Zoo and the Lake, which is used for skating in winter and paddling in summer. In total the park has 21 playgrounds, 48 fountains, monuments or sculptures and 36 bridges. Built in 1896, the Statue Of Liberty was France's gift to America and today remains a famous world symbol of freedom. The statue offers fine views of the New York Harbor and lower Manhattan and is located on Liberty Island. A short boat ride is required to get to the statue itself and it can be seen from Battery Park on the southern tip of Manhattan. From here, visitors can catch the ferry to the statue and Ellis Island. Once the world’s tallest building, the 381 m tall, 102-storey building is still one of the city’s most famous landmarks, with its iconic airship mooring mast. There are two observatories on the 86th and 102nd floor, the latter standing 1,250 feet above the bustling streets below allowing views of up to 80 miles on clear days. The Brooklyn Bridge, with its limestone, granite and intricate steel cables is one of the oldest suspension bridges in the country spanning the East River, connecting Manhattan to Brooklyn. The bridge remains an American landmark that has inspired generations of poets, songwriters and painters. The Chrysler Building is one of New York's most recognizable landmarks. Built in 1929, the Chrysler Building was briefly the world's tallest building and remains the epitome of Art Deco architecture. Broadway usually refers simply to Broadway theatre which encompasses a large number of theatre venues in New York’s theatre district. Widely acclaimed as the pinnacle of American theatre, catching a show on Broadway is considered a must-do for theatre lovers visiting the Big Apple, where they can catch, the latest shows as well as the long running classics. Times Square is exciting, colorful and always jumping. A visit to New York is simply not complete without catching at least a glimpse of its neon lights. After midnight it remains a hive of activity. New Year’s Eve sees the annual ball drop when New York's famous Waterford Crystal Ball descends 77 feet from a pole on the One Times Square building. If attending, be sure to get there early and brace yourself, as the area becomes very crowded. Set on an abandoned rail track on Manhattan's West Side, this 1½-mile-long landscaped park stretches over three of New York’s liveliest neighborhoods -the Meatpacking District, West Chelsea and Hell's Kitchen. Sweeping views of the Hudson River and Manhattan's cityscape can be enjoyed from 30 feet above street level. Fifth Avenue is considered New York's premier shopping area. A large number of top end designer labels have flagship stores along this famous avenue including Cartier, Tiffany, Bergdorf-Goodman and the famous Apple Store Fifth Avenue and Saks Fifth Avenue. A vast entertainment and shopping complex in the middle of Manhattan and home to NBC-TV and radio. There is an outdoor skating rink which is always popular in winter. There are shops and restaurants inside. The main centerpiece is the 70-storey RCA Building which has great views of midtown Manhattan, while the Top of the Rock Observation Deck also offers stunning views of the city skyline.